Through the Big Bureau Creek project, TWI seeks to advance the use of small, precisely sited wetlands by farmers to naturally reduce excess nutrients leaving farm fields in the form of agricultural fertilizer runoff, a conservation practice that results in improved water quality. Of the various practices farmers can employ to reduce nutrient runoff under the federal Farm Bill, installing wetlands is one of the most effective, yet most underutilized. Over the next year, TWI will be partnering with farmers to help them install a wetland site on their property to demonstrate the wetlands' effectiveness to their peers (see article in our February enews). 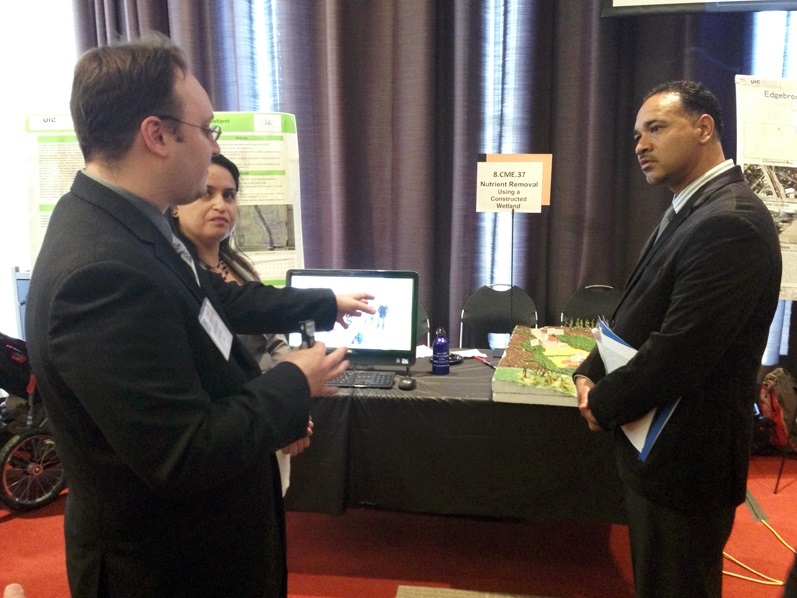 UIC senior engineering students Paul Jacobs (left), Diana Mejorado, and Caleb Carr (not pictured) present their farm-based wetland design at UIC’s annual engineering expo on April 22. Photo by Vera Leopold/TWI. TWI board member Christopher Burke, president of Christopher B. Burke Engineering and a professor of practice in UIC’s Department of Civil and Materials Engineering, knew about TWI’s need for engineering work and mentioned the idea to Paul Jacobs, who was taking one of his classes. Paul shared it with the other two students. After communicating with Jill, they soon committed to completing the design as their senior project. 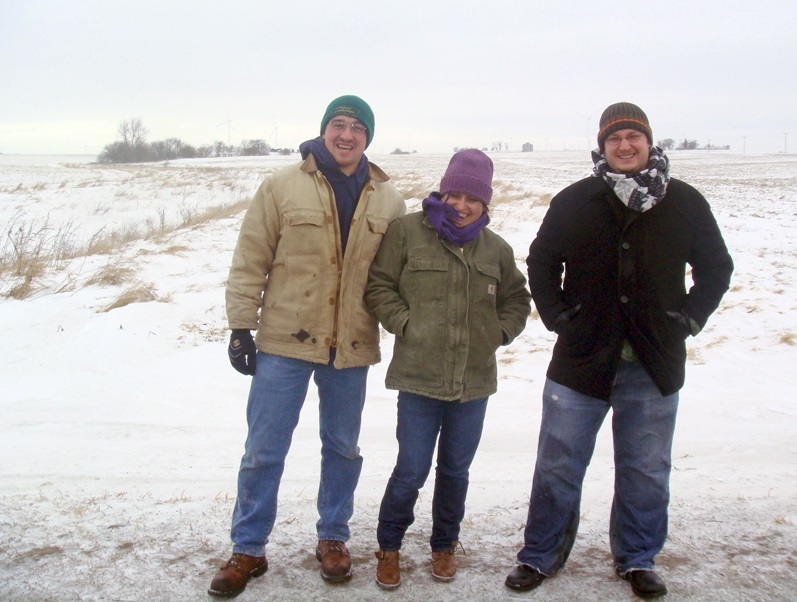 The UIC student team (from left to right: Caleb Carr, Diana Mejorado, and Paul Jacobs) on their February site visit to the Big Bureau Creek Watershed. Photo by Jill Kostel/TWI. The students worked on the design over several months, getting regular feedback from Jill as well as their UIC advisor, Dr. Karl Rockne (also collaborating with TWI on the Big Bureau Creek project), and their outside engineering advisor, David Buckley, who works for Christopher B. Burke Engineering. To see the on-the-ground placement in the landscape of a potential wetland site, the students accompanied Jill on a site visit to the property of an interested landowner on a cold and snowy day in February 2014. They looked at four potential locations and selected the most appropriate. The three students’ final products included a template of the hydrology and engineering parameters for the wetland design, a site plan, and a cost analysis for the wetland’s construction. They also produced a small-scale model of the wetland illustrating its structure, water depths, and agricultural setting, which they had on display at the engineering expo. The wetland model on display at the UIC engineering expo. Photo by Vera Leopold/TWI. After running simulations using rainfall and nitrogen concentration data, the students estimated that a wetland approximately 10 acres in size would achieve a 65% reduction in nitrogen in water leaving the wetland, surpassing the goal of 45% nitrogen removal. This wetland was designed for maximized nutrient removal and is much larger than what will likely be implemented. TWI already has two interested landowners lined up to implement a demonstration site on their property. U.S. Department of Agriculture farm assistance programs will reimburse farmers a portion of the cost for implementing a constructed wetland through the Farm Bill. The USDA’s Natural Resources Conservation Service (NRCS) needs to give the final approval for a wetland design. With a basic design in-hand to present to NRCS, TWI can save the agency staff time and resources; NRCS staff would otherwise have to design the wetland from scratch themselves. Construction of TWI’s first demonstration wetland in the Big Bureau Creek Watershed is expected to begin in summer 2015.